More than 30 residents at a sheltered housing complex in North Lanarkshire have been moved to temporary accommodation after a fire. About 40 firefighters attended the blaze which broke out in one of the flats at Unitas Court in Unitas Road, Bellshill, at about 20:15 on Sunday. Two people were rescued by ladder from the two storey building and several more were led to safety. Two residents were taken to hospital suffering from cuts and bruises. A spokesman for Strathclyde Fire and Rescue Service said: "Firefighters with breathing apparatus and hose reel jets battled through heat and dense smoke to search the complex and deal with the ground floor flat fire." He added: "Firefighters set about administering trauma care to five residents pending the arrival of the oncoming ambulance and paramedic personnel. "The residents received precautionary check-ups at the scene by paramedics and two were taken to hospital suffering from cuts and bruises." 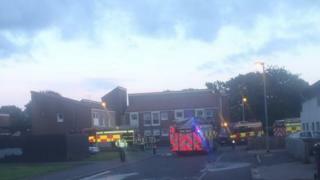 The service fire said the blaze started in a ground-floor flat in the complex. A full investigation into the cause will be held jointly with Strathclyde Police.